Cathy F. Gautreaux is the Deputy Administrator of the Federal Motor Carrier Safety Administration. 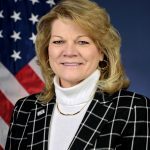 As the Agency’s second-ranking official, Cathy is principally responsible for overseeing FMCSA’s day-to-day operational programs and activities, which are performed by more than 1,100 employees located in its Washington, D.C., Headquarters, four regional Service Centers, 52 Divisional Offices and 31 Field Units. Prior to being asked by President Trump and by Secretary Chao in November 2017 to join FMCSA in an executive leadership role, Cathy had a long and distinguished career working in law enforcement, regional and national commercial trucking and in transportation safety. As Deputy Administrator, Cathy believes that compliance is first and foremost, and she wants to help motor carriers run safe and successful truck and bus operations. Cathy brings a State’s perspective to FMCSA. A graduate of Louisiana State University with a degree in criminal justice, Cathy initially began her career working as a detective in the Ascension Parish, Louisiana, Sheriff’s Office for four years. She later joined the Louisiana Motor Transport Association serving as its Executive Director for more than three decades. Cathy is a past National Chairman of the Trucking Associations Executive Council. During her career, she has been selected to serve on numerous prestigious national and regional boards, commissions and task forces addressing the full spectrum of intermodal transportation issues, including: homeland security, emergency disaster relief, incident management, commercial vehicle safety technologies, alternative fuels, oversized/overweight vehicles, commercial driver’s licenses, railroad grade crossings, work zone safety, distracted driving and other topics. Whether it is the movement of freight or the transportation of passengers, Cathy’s experience has taught her that, at their core, these industries are ultimately about the people: the drivers, the small business owners, and the motoring public. With a thorough comprehension of FMCSA’s unique responsibilities, Cathy is committed to keeping our nation’s transportation-dependent economy vibrant and strong while ensuring that our highways and roads remain the safest anywhere in the world.